Tikkun Olam, repairing the world, is infused in every aspect of our Temple community. 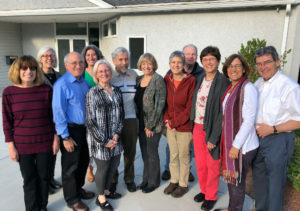 As Jews we are committed to healing, whether it be our Temple world, our surrounding communities, or supporting and lobbying for national and international social and political issues. Our Congregation provides its members with many opportunities for social action and justice. Our programs benefit women’s shelters, the homeless and the hungry, the elderly, and our environment, By reaching out to people in need, we not only help to repair the world, but also strengthen our Jewish identity and provide an important example of our values for our children. We try to be nonjudgmental, progressive and encourage collaboration with other faith and community groups. We support pluralism, inclusiveness and tolerance. We embrace issues supported by our Jewish teachings and tradition: justice, openness to the “other”, and support of the needy and vulnerable. We work on a national level by being an active part of the Religious Action Center of Reform Judaism. Congregation Shalom members provide food each month for people in need at the LTLC. The third Thursday and/or Friday(by 4:00pm) of each month, volunteers leave designated prepared food in a cooler in front of the temple. Every other month the requested food items are meatloaves and/or brownies, with the alternating months being salad and/or brownies. Each month members will be reminded of the date and the requested food item in the newsletter. Contact socialjustice@congregationshalom.org for more information. Every 8 weeks Congregation Shalom members volunteer to help serve food to those in need at the Table of Plenty in Chelmsford. If you are interested in volunteering please contact the Social Action Committee. Please contact us at socialjustice@congregationshalom.org.